Earth Day is coming up and everyone is looking for cute planet-friendly crafts to do. One of our favorites is this upcycled soda bottle planter my 6 year old made for school! It’s Earth Week at her school and each grade had a different upcycled project to make. The kindergartners had to make planters and she decided to make a “girl planter” — of course. She liked the idea of a see-though planter so I cut the top off of a soda bottle for her to work with. She added bottle top eyes, toilet paper roll strip ears, and even pipe cleaner earrings! 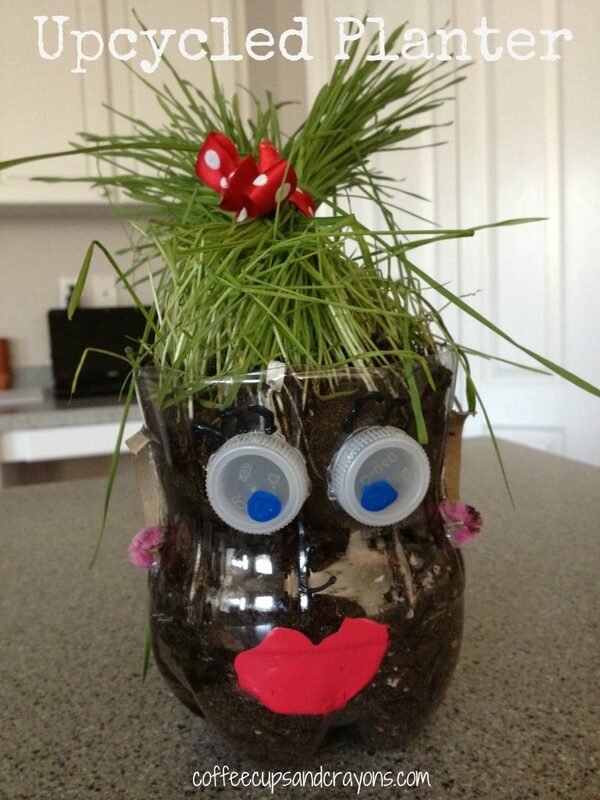 She really wanted to be able to put a bow in the plant hair so we planted a wheat grass plant. After it was in she gave it a “hair cut” and then we tied a bow around it. I see a little family of people planters in our future! What a great idea, thanks for linking it to kids co-op’s special earth day edition. Thanks so much! So many fun Earth Day ideas on the Kids Co-op this week! What a nice surprise! Thank you so much! There were many cool things this week. Woo hoo! These are so cute!! Thanks for sharing, I have pinned and shared on Google+! Hope your having a wonderful weekend!! Thanks so much Nicole!!! It really is one of our favorites!